WASHINGTON — American negotiators have confronted North Korean officials over “suspected” secret nuclear facilities, according to a North Korean state news media commentary, which called the Trump administration accusations “fiction” and said they had led to “derailing dialogue” between the two nations. The piece, published over the weekend by Rodong Sinmun, the official newspaper of the Central Committee of the Workers’ Party of Korea, marks the first indication that American officials have pointed out specific nuclear sites to North Korean negotiators and, presumably, asked Pyongyang to shut them down. Despite laudatory statements by President Trump, North Korea has not agreed to any concrete steps to end its nuclear weapons program. 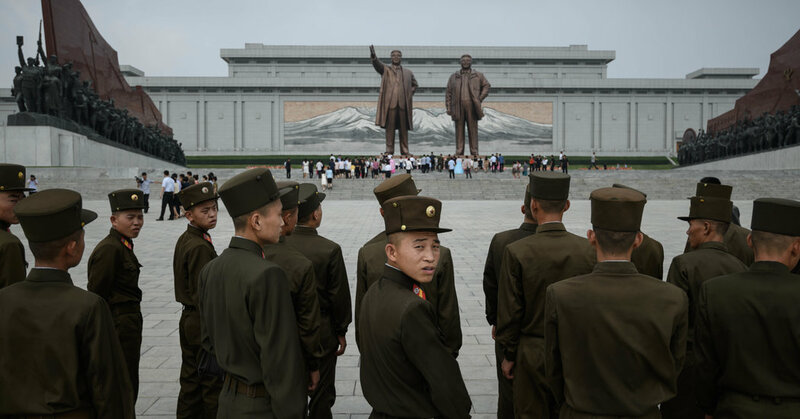 American officials have concluded that North Korea is still producing fissile material and, according to news reports, continuing to make long-range missiles at a site north of Pyongyang, the capital. The commentary also beseeched Mr. Trump to hold onto his “dream” of improving relations — what it described as an “epoch-making cause” — and push aside people in his administration who are trying to throw that mission off track. The commentary took a conciliatory tone toward Mr. Pompeo, in contrast with combative remarks that the North Korean government made about him in July, after his third trip to Pyongyang. In part, the commentary served as an olive branch toward Mr. Pompeo, and appeared aimed at wooing him ahead of an expected fourth trip to Pyongyang. The commentary did not name the “opposition.” But North Korean officials have expressed hostility toward John R. Bolton, the White House national security adviser, who has consistently taken an aggressive stand on North Korea and its nuclear weapons program. In May, Kim Kye-gwan, a vice foreign minister, released a long statement that said, “We shed light on the quality of Bolton already in the past, and we do not hide our feeling of repugnance towards him.” That came after Mr. Bolton said in April that the United States would look to Libya as a model for how to get the North Koreans to disarm; Col. Muammar el-Qaddafi agreed in 2003 to scrap his nuclear weapons program for sanctions relief, but was overthrown and killed by American-backed rebels in 2011. The latest commentary appeared to be an attempt to persuade Mr. Trump and Mr. Pompeo to push Mr. Bolton to the sidelines and move forward with talks — likely by relaxing demands for North Korea to take immediate steps toward ending its nuclear weapons program. Although the Singapore summit meeting generated good will, talks between the United States and North Korea have stalled in recent weeks. North Korea wants the Trump administration to sign onto a declaration of the end of the Korean War, which began in 1950. The United States has said North Korea must first take significant steps showing it is planning to end its nuclear program — including a detailed accounting of its nuclear assets. South Korea’s government has been pushing ahead with talks with North Korea on a peace declaration; it also wants the United States and possibly China to help with that process. The commentary by Rodong Sinmun said the “current deadlock” was a result of the “political scramble” in the United States. It said that “those opposed to dialogue provided the negotiating team with a truncheon” to point out secret nuclear facilities, which North Korean officials deny having. It did not give more details on exactly what the American negotiators said. During Mr. Pompeo’s visit to Pyongyang in July, he spoke over a secure phone line with Mr. Trump, Mr. Bolton and John F. Kelly, the White House chief of staff. A State Department press officer said on Monday night that the department would not comment on private diplomatic conversations but maintained that the United States was focused on a fully verified denuclearization of North Korea. Analysts of strategic issues in Asia said the North Korean commentary was noteworthy. On Sunday, Mr. Bolton said in an interview on ABC’s “This Week” that his understanding was that Mr. Kim had said “yes” to a suggestion in April by President Moon Jae-in of South Korea that North Korea should “denuclearize” within one year. He said Mr. Moon had reported this to the United States. Mr. Bolton added that Mr. Pompeo would be returning to North Korea soon, this time for direct talks with Mr. Kim — or so the Trump administration hoped. Mr. Bolton also said there was “sufficient national security concern” about meddling in this year’s coming elections by Russia, China, North Korea and Iran. He declined to give any evidence or details.